Presentation on Friday, January 15, at 7:30 pm, 4th floor conference room, with Archbishop Amel NONA, exiled Chaldean Catholic Archbishop of Mosul, Iraq, and Marta ZAKNOUN, Journalist. Presentation on Friday, January 15, at 8:15 pm, 4th floor conference room, with Joakim KOECH, Principal, Card. Otunga High School, Nairobi, Kenya, and Abby HOLTZ, High School Teacher in Maryland. In this exhibit, three case studies illustrate the lasting impact that the AVSI Foundation and its unique method have had on the lives of people living in poverty and marginalization around the world. From Ecuador to Kenya to Brazil, the Exhibit opens up windows into the pockets of beauty and new life which have been generated where AVSI and its partners have been present. Faced with the expansive suffering and inequalities that exist in the world, many times we fall into either indifference or idealism. AVSI Foundation presents this exhibit to tell the story of people so certain that reality is positive that they have gone to the ends of the earth to affirm this conviction. A journey to the edge of the Solar system and beyond. Presentation on Saturday January 16 at 5:15pm, 4th floor conference room, by Maria Elena MONZANI, astrophysicist at the SLAC National Accelerator Laboratory. Researching the unknown is one of the deepest aspects of human nature. Our innate need for novelty represents a continuous prompt to “go beyond”, to be open to meet the unexpected, the unknown, the “other” (be it another person, another continent, another planet). Nowadays, science is a unique form of exploration that allows us to expand our knowledge of the physical world to limits that had never been reached before. But there is a precise branch of research that embodies, in modern terms, the same adventure of the ancient marines: space exploration. 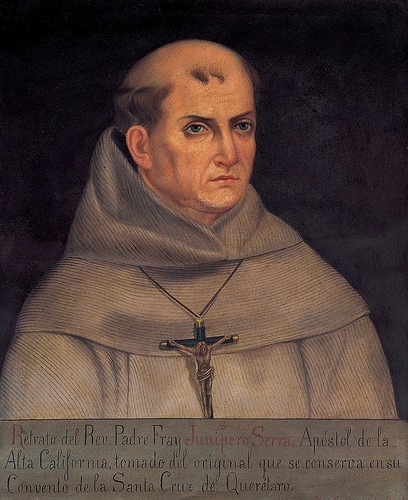 The life and works of Junípero Serra, the saint who founded the California missions. Presentation on Saturday, January 16, at 3:15pm, 4th floor conference room, with Rose Marie BEEBE, Prof. of Spanish, Santa Clara University and Robert SENKEWICZ, Prof. of History, Santa Clara University. The exhibit aims to underline that the missions that Saint Serra established were focal points designed for the integral Christian education of the Native American inhabitants. In the center was the church, around which revolved the life of the entire community. Christian education, moreover, was not limited to learning doctrine. The church was surrounded by classrooms, stables, liveries, grain mills, warehouses and workshops carrying out the different functions of the time, such as blacksmithing, tile making, tanning, and olive oil and wine production. Seeds were brought from the Mediterranean world and readily adapted to California, in many cases with notable advantages, when admirable fruit orchards were developed. The missions were a wholly self-sustaining enterprise, around which a new civilization developed. Stories of extraordinary ordinary people told by Giovannino Guareschi, Italian novelist, and Enzo Jannacci, Italian songwriter.